I want a transparent background, but I can’t use PicMonkey anymore. Because it’s no longer free. There’s nothing surer on the internet than constant change (and usually in the pursuit of the dollar). We all struggle to keep up. Remember Periscope? Whatever happened to that? And Snapchat – seems after an initial blast, Snapchat has quietened down too and I’m wondering if it’s on the way out as well!? Facebook’s algorithms are constantly changing and I NEVER know what’s going to be in my newsfeed or how I can best reach my audience there. And since Facebook took over Instagram, I get stuff in my feed that’s a week old. Pinterest is chock full of sponsored posts too. Now PicMonkey has gone by the wayside as well. In the last couple of weeks, PicMonkey announced that it’s no longer a free platform – not even a tiered one, like it used to be. The only way you can use it is to pay (which is pretty sad, because I used to love how you could combine PicMonkey with Canva and do just about any kind of graphic you wanted!). My good friend Karyn Sealby is using the paid version and still loves it – she says there have been numerous big improvements in functionality lately that she says have made it even better. If you’re on the paid version of PicMonkey, I’d love to hear your thoughts! But where does that leave us, who just want to use a few of the basic tools, such as being able to use your own fonts, and create shapes with a transparent background? Well, now that PicMonkey is gone, we head right on over to Gravit Designer, that’s where. It’s a step up from free PicMonkey – besides all the image-editing stuff, being able to create things with a transparent background, and able to use your own fonts, you can also create your own vector shapes as well, AND download them as .svg files too! If you’re not sure what that means, it simply means you can create shapes that never lose their crispness, no matter what size they are – which is PERFECT for logo design, and pattern design too. And they’ve promised that “We will always keep it as a professional yet free design tool”, so that’s excellent news for us! You can use it online, or you can download a desktop version as well. While Gravit Designer is a bit more complex than PicMonkey, they also have a simpler version called Klex – which at first glance looks a LOT like Canva. And while there are things that Canva can do that it can’t (and I must admit, I find some things in Klex a bit “buggy”), there are also lots of things that it can do better than Canva as well – for instance, flexibility in its vector illustrations, and font alternatives. However, if you’re feeling OK about the tech side of things (and honestly, you don’t have to be a tech whizz or anything), I’d go for Designer. It can do just about everything you’d want – crop, import your own fonts, create vector illustrations, and a whole lot more. It’s got lots of alignment tools (snap functionality, grids, auto alignment), and image editing. Over the coming weeks, I’ll be doing some Facebook lives on tips and tricks for Gravit Designer – so I hope you can join me! Every Friday at 10.30am AEDT and you’ll get the low-down. It’s quite new to me too, so you can join in as I discover what it can and can’t do – and as always I’ll be getting inventive, so if there’s something it can’t do, I’ll figure out a way around it. You can find me on Facebook at facebook.com/tractorgirl.viz.biz. See you there for Friday morning Facebook Lives! 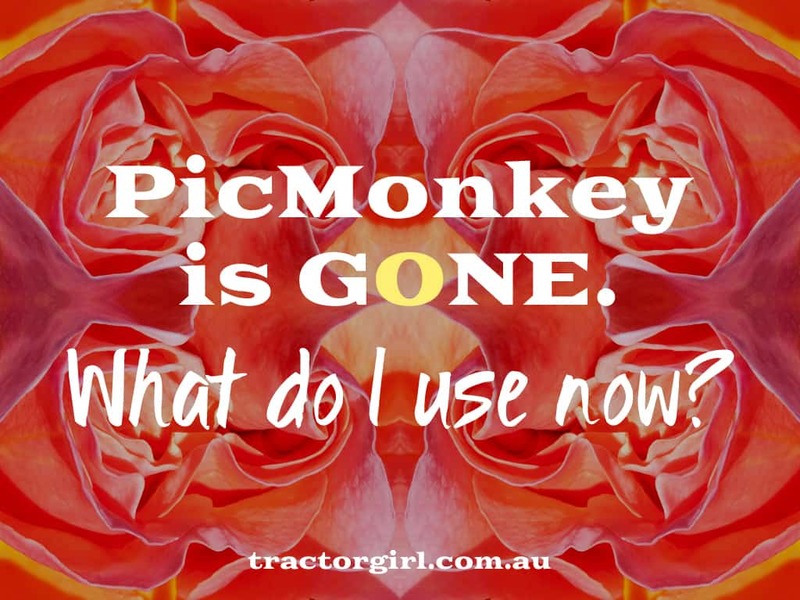 I’ve used PicMonkey for years! I paid for one year but it’s not worth it. Canva does more for me and I only use PM to crop so no problem! Thanks for the heads up re the new tool! Hi, Very good article ,Thanks for sharing keep up the good work. I don’t use this kind of tool myself as I have Photoshop. (Though Canva comes in handy for quick social media graphics, as they already have the sizes figured out.) But good to know there’s an alternative available! Thanks Louise, yes! Even though I have Photoshop too, I do pop into Canva and make things sometimes, as there are some VERY handy features! I have paid for the full version of PicMonkey for years. A key tool in my business and worth every cent. It in fact too cheap for what it offers my business. Wow Tania, that’s a hearty endorsement! And like Karyn who I mention above – it seems the people who have had the paid version for a while love it. Thanks!